In most suburban homes, you wouldn’t be surprised to find an array of dusty objects — pencil sharpeners, empty milk bottles, skateboards, air fresheners and perhaps a Mr. Potato Head — tucked into corners of spare bedrooms. In Andrew Marietta’s house, in Cooperstown, New York, this stuff shares a common theme: September 11, 2001. Marietta is the owner of one of the world’s largest private collections of September 11 memorabilia. Stored in boxes scattered around his home are 1500 to 2000 objects originally produced by companies to commemorate the event. Many of these items are strange in their ordinariness: Marietta’s collection includes not just plaques and flags but things like pens, candy and tissue boxes. Marietta is 35, and works at a nonprofit association and manages rental properties. He has been amassing these objects since 2001, when, as a museum studies graduate student, he noticed entire aisles of grocery stores and corridors of malls erupting in red, white and blue. “It was almost like 9/11 was its own brand,” he said. 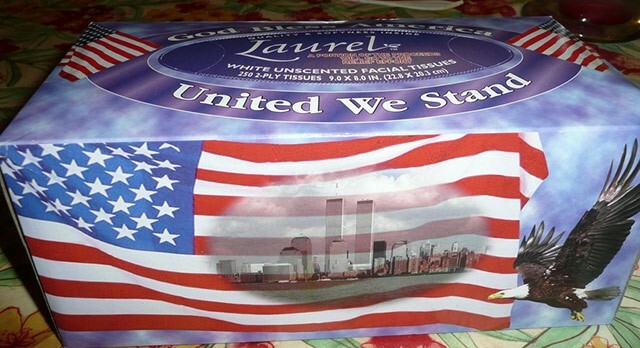 While 9/11-themed silverware might not be ideal for a dinner party, it can have another use: helping people connect with a tragedy by serving as tangible proof that it actually happened. The more quotidian an object, the further it is in magnitude from the event it’s meant to conjure. That’s a distance that can be offensive — yet everyday stuff, by virtue of its ubiquity, is also more likely to trigger a memory than sacred things we unwrap only once a year. I asked Marietta for his thoughts on tribute objects, shopping as therapy, and tracking down old beer bottles on eBay. We spoke by phone. Alice Hines: What is the most interesting item you’ve acquired recently? Andrew Marietta: This six pack of beer I got last week on eBay is pretty cool. It’s a brand called Fire Company Brew, made by a retired firefighter who was at the Twin Towers on 9/11. The bottles are empty because the previous owner drank the beer, but it’s basically a bottle with a fire department insignia and a label that explains the concept. There’s a whole thing about how money goes back to support a Fire Company Brew victims fund. It’s interesting to see how people started their own little businesses around the concept of 9/11. 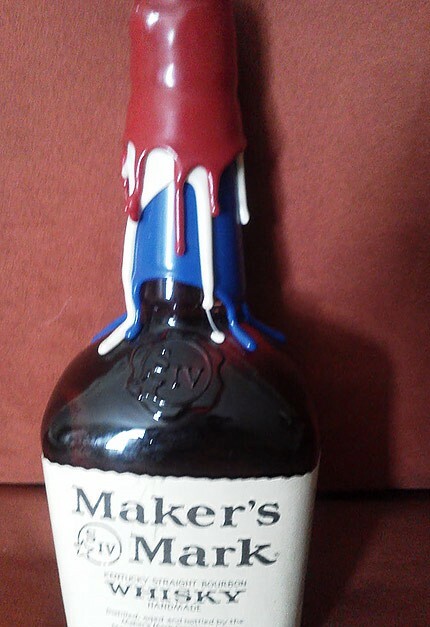 Maker’s Mark Tribute Bottle, 2002. Why did you start collecting this stuff? I’m originally from Minnesota and I moved to upstate New York for a museum studies master’s program in Cooperstown. 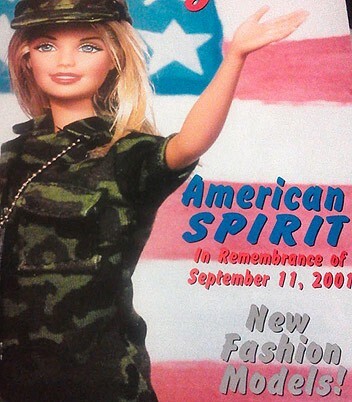 After 9/11, stuff started popping up everywhere. At first it was magazines, ephemera and flags for your cars. Some folks from the New York State Museum came to our graduate program and talked about collecting fire trucks, rubble and things like that from Ground Zero. I knew there was so much more stuff that no one was noticing. We’re surrounded by consumer goods all the time, so most people weren’t thinking about it. It seems like companies were also carving out a place for themselves in the history of 9/11. Yeah, the objects allowed the companies to put their own stamp on things. If you look at Maker’s Mark, they’re well known for that wax seal. They did a red, white and blue seal right after 9/11 in 2002. It tied that specific run of whisky to the event. When have you ever seen an [alcohol] company do something like that? Are you at all cynical about these efforts? I’m definitely a little bit cynical. 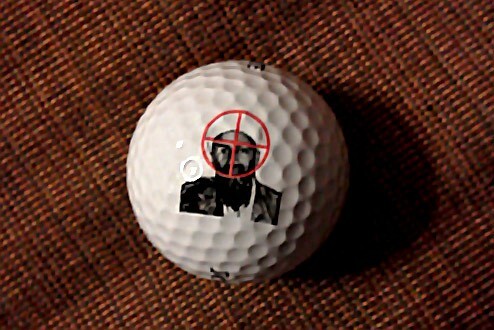 I do think that companies were trying to give back and be patriotic. But some of the stuff is over the top. At the end of the day, companies’ true motivation was sales. I’m sure everyone was caught up in the moment, like “yeah let’s do this, this is patriotic.” And I’m sure the side conversations were “this makes us look good, people will buy this stuff and we’ll earn a bit of money.” It’s part of their culture to produce stuff and make money. I’m not faulting them for it because it’s America! America has been a consumeristic society for a long time, though. Why didn’t anything like this happen before? I think there definitely were some examples. You can find tribute items from the JFK assassination, but never anything like a box of cereal that commemorated it. So the question becomes, why 9/11? I think maybe it was the scale of the event and how unimaginable it was that someone could carry this out on American soil. So 9/11 and New York became this rallying point for everybody, including corporate America. You had George W. Bush saying after 9/11, “Don’t stop spending money, don’t go hide.” Corporations saw an opportunity. This was their way of playing a big role. Do you distinguish between companies who donated all of their profits to charity and those who only donated some? In the last couple years [the media] started talking about accountability of 9/11 charities, but no one ever considered this for products. I’m not saying that companies never wrote the checks, but we also don’t know how much money they generated that they didn’t donate. I don’t know if we’ll ever know. Why do you think people bought the objects? Buying things made people feel better. It’s such a part of American culture. It’s also the fact that money is being donated. But it’s also self-gratification and because people wanted to have a direct connection with the event. A guy in Iowa can’t touch a firetruck or even see it without coming to New York and going to the State Museum. But he can buy a belt buckle made in commemoration of 9/11 at the Iowa County Fair. It’s his way of touching the event. But it’s not just a direct connection to 9/11 that people are buying with these objects, right? It’s also the idea of owning a piece of history. If you only wanted to feel connected, you could donate or volunteer. Yeah, people could have made the choice to directly donate to a charity. But they also wanted to have a piece of the event. What do you get from donating to United Way in New York City? The benefit of knowing they’re making a difference, but nothing tangible. But if you go and buy that Mr. Potato Head, you get an object you can touch and feel which is also tied to September 11. The thing I think is interesting is that many of these objects are so quotidian. Like the tissue box, for example. 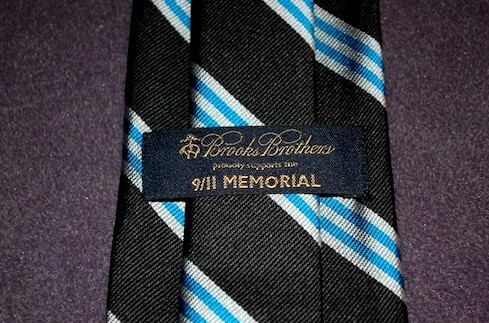 It encourages you to integrate memories of 9/11 into your everyday life. Yeah, absolutely. I have a milk bottle from a family farm that you would never expect to have a tribute message about 9/11 on it. 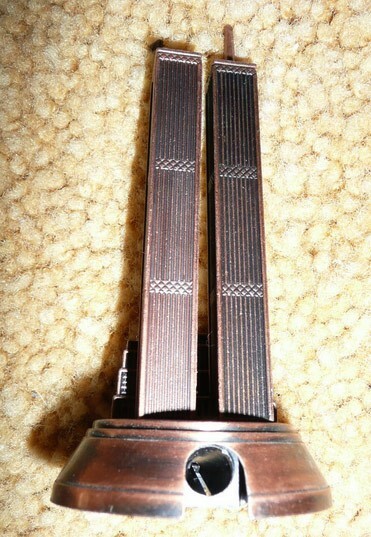 Or I have a silverware set that has the Twin Towers on the handles. The question is, would you really buy this and eat with it? That 9/11 throw pillow — are you really going to put it on the couch? I would love to know what the companies thought. I think they intended this stuff to be used, but I don’t think people are actually using it. 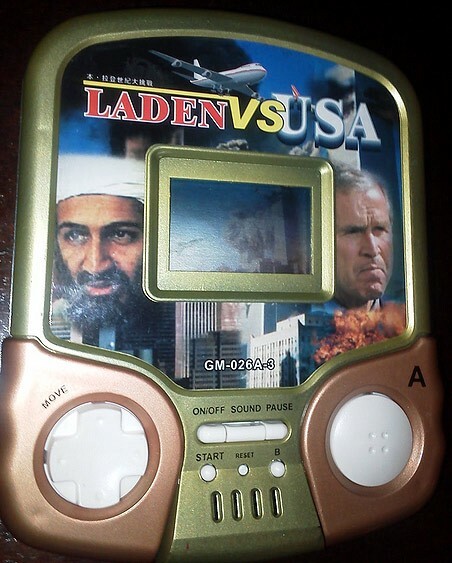 I have one scenario in my head where they thought people would actually break this stuff out every year on 9/11. It’s almost like they thought 9/11 would be the next Valentine’s Day or Halloween. Or at least Memorial Day or Veterans Day. Right, or the next Fourth of July. I’m not saying it won’t happen, but so far I don’t think the material goods have stuck. 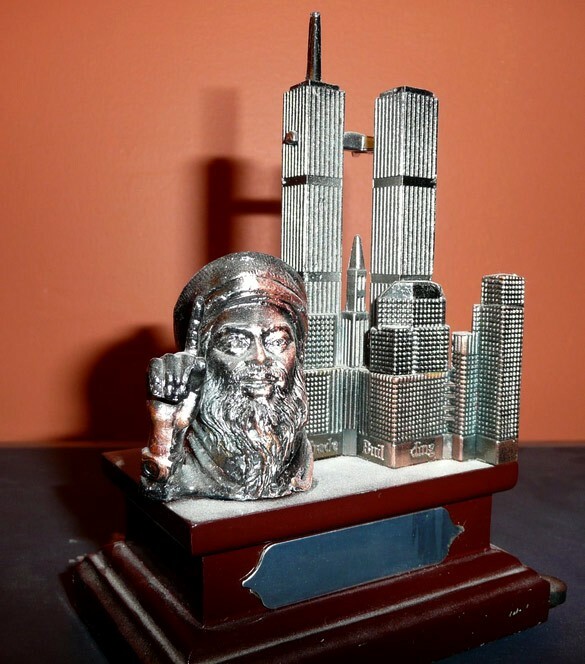 Your first post on your blog was about a lighter you found in Dubai that shows the Twin Towers being hit by a plane, with a bust of Osama bin Laden in the foreground. What’s the story behind that? The lighter shows the other side of things, how 9/11 influenced material goods elsewhere and how the event has different meanings to some people. My parents lived in the United Arab Emirates for 10 years while I was in college. I bought the lighter from a street vendor in Dubai. My dad was pissed, he thought it was offensive and upsetting. I bought it and flew it back in my luggage, which is crazy now thinking about it. Where do you buy most of your items? A lot of it is on eBay. In the beginning, you could find stuff in stores, but now that we’re more than 10 years out it’s getting harder. I just acquired a new item on eBay, a knife from Spyderco, which is a company based in Colorado. 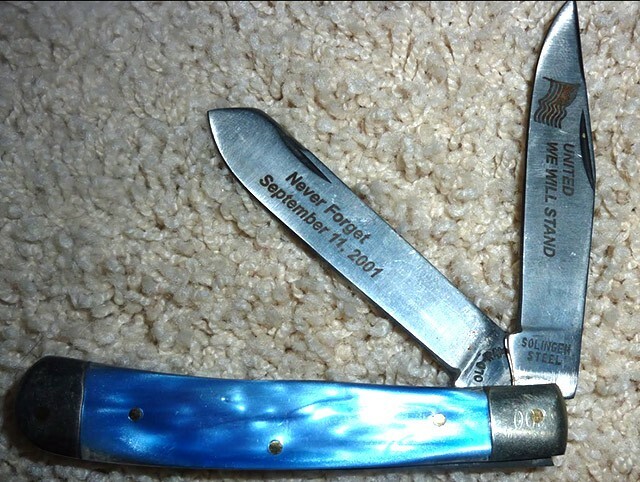 They made a limited run shortly after 9/11, 2000-some knives using steel from the World Trade Center site. 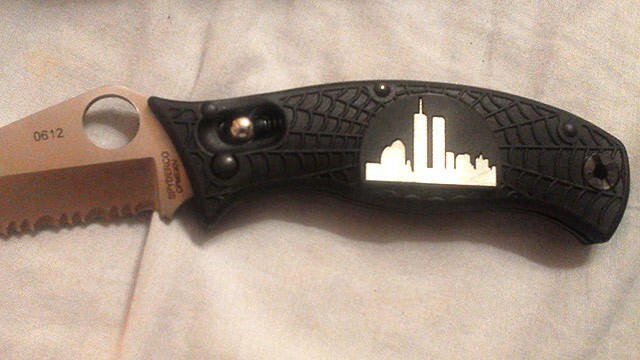 Spyderco World Trade Center Fundraising Knife Project: Knife with WTC steel and Presentation Box. How much did you pay for the knife? $425. It’s not a huge amount of money but they usually go for $700, $800, $900. It was a great deal so I couldn’t pass it up. Another object I picked up recently was a game. There is actually a board game called “Ground Zero: It’s Only a Game to the Politicians.” A New York City-based guy, a former firefighter, made it and sunk a whole bunch of his own money into producing it. It’s a cynical thing. Do you have any plans for your collection in the long-term? What are you going to do with all this stuff? I don’t know. I’m not opening my own museum, that’s for sure. I’ve recently made this connection with the curators of the 9/11 museum. I don’t know if they would ever take my collection. Some of it is dicey and would upset people. I can tell you though, that if something were to happen to me my wife would reach out to them and see if they wanted it. How much time do you spend on the collection? I waste a lot of time and a lot of money. [Laughs] I don’t see it as a waste, though I would never deny that a lot of people see it as a complete waste of time and energy. I’m not going to fight that perspective. My wife tells me all the time she thinks it’s a bunch of crap. She hasn’t tried to kill me yet over it, though. She came with me to a meeting with the curator [of the 9/11 museum] earlier this year in New York City. Wouldn’t other people learn more from the collection if it were stored more publicly? 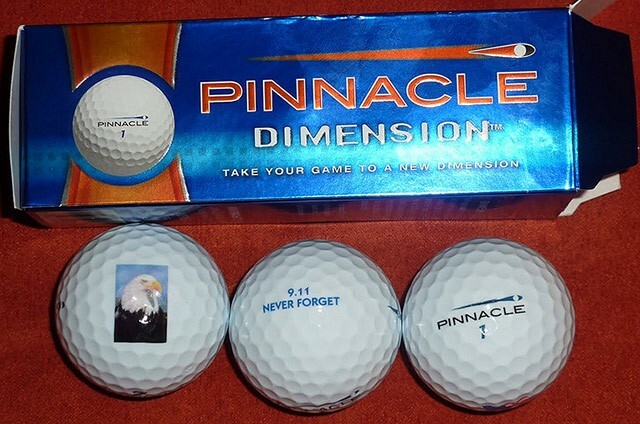 Are there other collectors of 9/11 memorabilia around? You wrote on your blog that your own experience of amassing this collection is consumeristic. How is your relationship to these objects similar or different than those of their original owners? I look at it as an ironic thing. This stuff was sold so people could buy it; now it’s out there again and I’m collecting it. I’m doing the same thing that was originally intended for these objects. So it’s similar, but our motivations are different. Originally, people wanted to connect with 9/11 by having a physical piece of it. For me, it was not necessarily about feeling a connection to the event but because I recognized that these objects were unique. I knew that if I didn’t save them they would get thrown away and 20 years later people wouldn’t remember the full impact. So you collected them for historical significance. 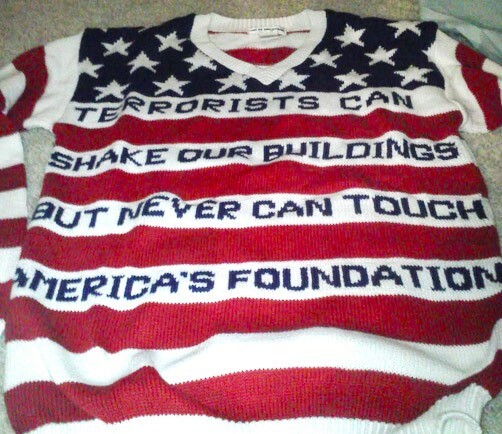 “Terrorists Can Shake Our Buildings…” Sweater. See also: Ralph Lauren Polo Tribute Sweater. Alice Hines is a freelance writer in Brooklyn. You can find her on Twitter: @alicehines. Photographs courtesy of Andrew Marietta. This interview has been lightly edited.